The first true 'Norther' of the season will soon make its presence known in Houston in a BIG way. Find the coats and jackets, you'll need 'em! HOUSTON — A true Texas 'Blue Norther' is on the way that will bring dramatic changes to the temperatures beginning as early as Friday and lasting all the way through next week. 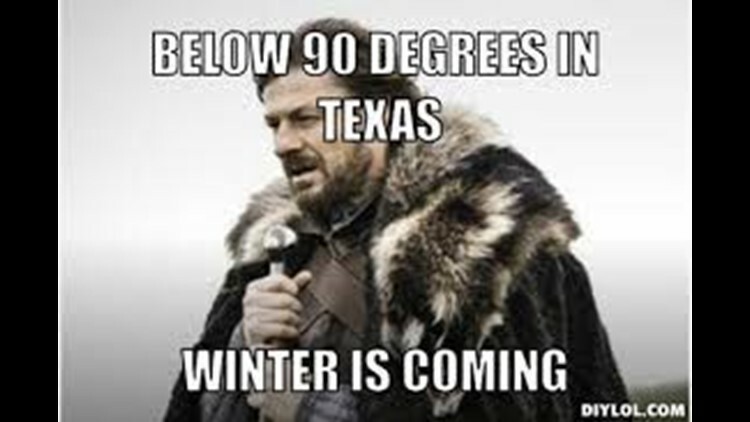 Oh it's going to be below 90 alright. It might even be below 50 --- for daytime highs heading into Tuesday and Wednesday. This is the first true slap in the face from Mother Nature this coming week. Could that slap include a kiss of a few snow flakes as well?! Well, it may happen closer than you think. Already freeze watches (light blue) have been posted for north Texas, including the Dallas area, Oklahoma, Arkansas Tennessee and Mississippi and freeze warnings (dark blue) have been posted for parts of Oklahoma, Arkansas and Tennessee. It's looking more likely that even we here in southeast Texas will require a frost and or freeze advisory by Tuesday evening for Wednesday morning. A series of cold fronts will be moving through, each progressively colder. The first front is working its way into our region now while the next big front will push through on Monday evening. The first front will provide the refrigerated air but clouds and drizzly weather will keep things cold heading into Friday and the weekend while Monday evening's front will clear us out to allow for beautiful but downright cold weather next week. Expect high temperatures to hold in the mid 50s on your Friday and remain in the low to mid 50s for Saturday and falling to the upper 40s to near 50 on Sunday and Monday with rainy conditions persisting. Skies turn sunny and clear with very cold temps persisting (upper 40s to near 50) on Tuesday and Wednesday before slowly warming up into the upper 50s Thursday and low 60s on Friday. Overnight lows will hold in the upper 40s until we get to Tuesday morning when we're likely to see our first 30s area wide followed by our first freeze by Wednesday morning. Temperatures this low for daytime highs is significantly below normal. Our average high for mid November is around 75°F. Yeah, yeah, Blake, what's this about snow? Yeah, I buried the lead. So here's the scoop: while the temperatures will drop sharply here locally, it'll be even colder to our north which may allow a very brief window of opportunity for precipitation ending behind the front to change over to a few light snow flurries near the Dallas area -- and perhaps as far south as the far, far northern reaches of the Houston viewing area. 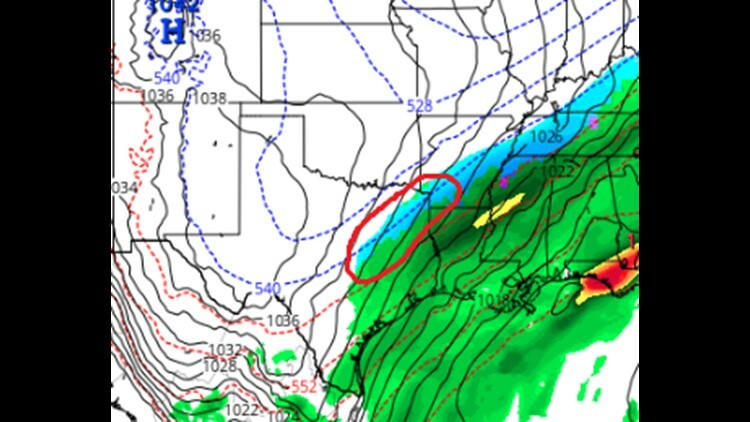 Snow flurries possible between Houston and Dallas overnight Monday into Tuesday according to the 12z GFS? Now, please keep reading--there's a "but." The 'but' here is that it's one model out of many and that one model has only showed the snow flurries a handful of times. We are not looking for snow in Houston or anywhere close to our immediate area this go-around. Nonetheless, it definitely raises an eyebrow. Snow flurries in November isn't so unusual in north Texas. The Dallas area has recorded 30 trace and or measurable snowfalls in November since 1898. Do you like my blogs? Then follow me on Twitter HERE! Every follow is greatly appreciated.